History: Balsam fir was a popular remedy in early times of America. It was applied for medical conditions, and each part had its own purpose. Resin was a healing remedy for burns, sores, and cuts. Additionally it was applied for asthma, coughs, and colds. The bark, taken if form of tea, was an effective remedy for chest congestions. The branches were used to fight constipations. Root extract was chewed for curing mouth ulcers. Needles served as a supplement for baths. Inhalation of its steam was considered beneficial for coughs and colds. Used For: Balsam fir produces resin which is applied for gluing optical lenses and slides, as well as used for production of turpentine. Additional Info: Balsam fir can reach a height of 50 feet on average. 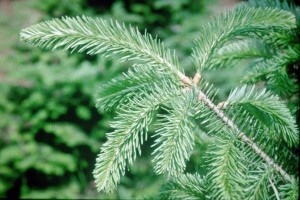 Its evergreen needles are flat and green-colored. The plant blossoms at the end of the spring or at the beginning of summer. Flowers are divided into female and male. Young bark is grey-colored and rich in resins. As the tree grows older, resin clots form into plates.